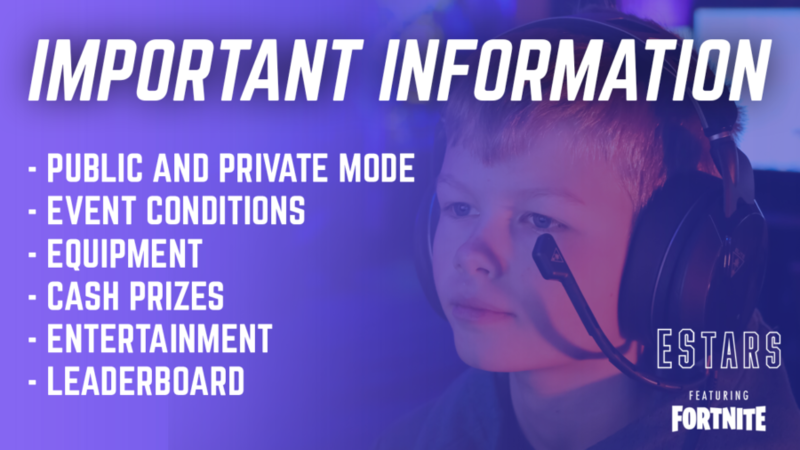 Whilst we do have access to private mode, supported by Epic Games, technical issues have prevented us from utilising private mode at our first events. In order to ensure the competition and road to the Final is fair, we have opted to play in public mode for the remainder of the Tournament – until the Finals stage. The finals at Stamford Bridge will be a private game, whereby the top 100 players are playing against each other and battling it out to £25,000. For further information on how we score these games, visit our FAQs page (See Q7). Please note that this scoring system will be used for both public games as well as in the final when private mode is enabled. Please be advised that we are required to keep the room at a certain temperature due to the number of machines and equipment present. Please be advised that you should wear warm clothing as the event space can become quite cold. Before each gaming slot begins, we will allow you to play practice games. During this time, it is imperative that you notify staff of any issues with equipment. Please be advised that you may experience lag, as with any normal game. If for any reason you experience any issues with equipment during your game, please raise your hand and a member of staff will be with you immediately. We are offering cash prizes to winners of each session. We also offer cash prizes to dance contest winners and others who play well on the day. Please see our FAQs page (See Q8) for further information on prizes. We work hard to provide a great experience for all attendees. At the event, you will get to meet your favourite characters, enter through a real-life Battle Bus and take part in dance contests. As we have thousands of players taking part in the tournament, it is difficult to provide every attendee with swag. However, we do hand swag out at every event to the best dancers and all around great players! We endeavour to announce our leaderboard early the following week after each weekend event. This will be announced on our social channels and we also have a full list of finalists available to view here. We are paying close attention to plays throughout the tournament and wildcard players are currently being chosen at the end of every event. However, we will need to wait until closer to the tournament end to announce final wildcards as we only have a set number of wildcard spaces. EStars featuring Fortnite is visiting some of the greatest stadiums across the UK. Our Fortnite battleground is being built on stadium concourses, this allows us to keep all of the machinery and systems cool but it can be chilly… so be sure to wrap up!